While smaller pet rodents, like hamsters and gerbils, are more prone to being escape artists that can extract themselves from their cages and get lost in the house, a guinea pig’s size and personality typically precludes him from this type of behavior. However, it's still possible for your pig to wander off or get out of an open cage and get lost while exploring. Make sure your pig can't go outside or encounter any dangerous hazards inside the house. Check that exterior doors and windows are closed and take up anything like mouse traps or bait boxes that could potentially hurt your guinea pig. Block staircases and close all closet and room doors to increase your chances of securing your lost guinea pig quickly. Put up other household animals like cats and dogs to prevent potentially dangerous interaction. 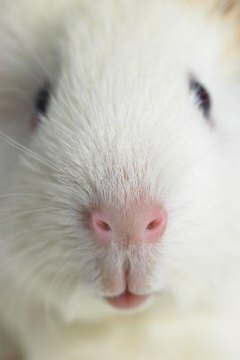 Look for your guinea pig on a room by room basis, starting with where you last saw him. This will help you avoid a situation where you startle your guinea pig from one room and he runs into another that you think you've already checked. Use a flashlight to look in closets and check under furniture. Use caution where you step and sit to ensure you don't inadvertently injure your guinea pig, and warn other household members to do the same. Leave your guinea pig’s cage open and place a bowl of food in front of it. Strategically place other favorite treats in other central locations of your home where you'll be likely to spot your guinea pig venturing out of hiding to take the snack. Since guinea pigs are nocturnal animals, you may have your best luck searching at night when your piggy is more likely to be active and running around than in the daylight hours, when he may be sleeping in a secure hiding spot. When you finally lay eyes on your guinea pig, remember he may be disoriented and scared because of his trip outside his comfortable home environment. If your guinea pig seems skittish or reluctant to come to you, you may have to catch him in some way other than using your hands. Gently tossing a towel over your guinea pig can stop him in place and allow you to safely pick him up without him getting scared and scratching. You can also put a laundry basket on top of him to hold him in place while you talk softly to him and get him calmed down enough to return to his cage.